Star wars movies have been around since I was a little kid. My older brother was a die hard Star Wars fan so I saw all the old movies growing up. I admit, although it was hard to get used to the new Star Wars movies they were a great addition to the original series, still enjoyed by many generations later. 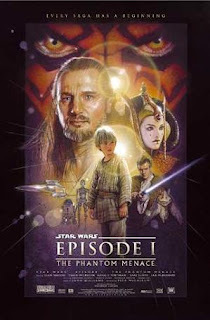 Star Wars Episode I - The Phantom Menace was the first of the series of Star Wars movies which told the story before the original three actually happened, when Darth Vader was just a kid. The movie was originally released in 1999. I've got great news for those die hard Star Wars fans out there! Star Wars Episode I - The Phantom Menace is being brought back but this time - in 3D! What's even better is Hasbro is celebrating with their new line of Star Wars toys! 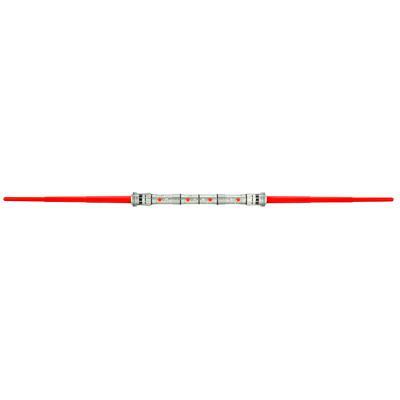 Darth Maul Double-Bladed Light Saber - The Light Saber is the ultimate weapon of the Jedi and sinister Sith. When good and evil battle, the clash of their blades can be heard throughout the galaxy. Grab your Saber and have some fun! 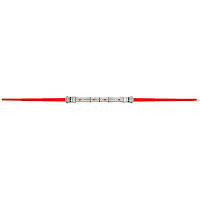 Become a master of light saber combat with this double-bladed replica, just like the one wielded by Darth Maul in Star Wars Episode I - The Phantom Menace. Mesmerize your opponent while you spin your saber and surprise him with the push of a button to release one or both blades! This particular toy I have deemed an outside toy as the blades reach out 5' and this could pose as a serious danger inside the house. Suggested age for this toy is ages 4 and up but with the size, I would say it would be more suitable for older children over the age of 6. Definitely a great collectors item for the Star Wars buff nonetheless. Star Wars Movie Heroes action figures - Detailed, 3.75" tall action figures based on the movie. Choose from several different characters like R2D2 who makes sounds and Yoda! Each figure comes with a accessories, a die and a collectors card. Great way for kids (and maybe some adults) to reenact their favourite Star Wars scenes. The Suggested age for these is 4 and up as they contain small (tiny) parts that may pose a choking hazard for younger kids and babies. Being so tiny, I think these are better as collectors items than toys to play with unless for an older child. Check out www.hasbro.ca for more Star Wars collectables and where to buy them! Prepare yourself for the return of the Sith! Catch Star Wars Episode I - The Phantom Menace in 3D beginning February 10th, 2012! Discloser: Review written by AME on behalf of Hasbro. Complimentary product was received for review purposes. All opinions are honest and those of AME.